Surviving the World began on May 31, 2008 at the Fred Paulson Institute in Wincheck City, Pennsylvania (a fake college name and location used in place of Cornell University in Ithaca so that certain advisors would not discover the site), was temporarily based out of a basement storage closet in Sharpe Valley, MD (another fake location name, necessary because of a government contract with NIST), is currently located at Northeastern University in Massachusetts (an actual location and actual state name), and hopes to run for several years to come. Q: What is Surviving the World? A: Surviving the World is a webcomic focusing on all shades of life, from science to literature, politics to sports, romance to religion, and everything else in between. Q: How often does it get updated? A: A new lesson is posted every day, seven days a week. Q: What college do you work at? A: I'm a teaching professor in chemical engineering at Northeastern University in Boston. Q: Wait, but that means your name is actually . . .
A: Yes, it does. Don't worry about it. Q: I like your site! What's the best way to share it with other people? A: Hey, thanks! Please link directly to the page, not the comic image. And don't rehost the comic images, for hark's sake. That doesn't help exposure, it just makes it very easy for someone else to profit off of my work. If you're unsure of how to link, use the "Share" button you see on the right side of the page. Q: Is there a syllabus available? The topics seem kind of wide ranging. A: No one really wants to hear about college or religion or bar arguments for seven straight days, so while there is a general plan in place, the topics will be jumping around. Q: What’s the difference between a lesson and a recitation? A: Lessons are the usual, straightforward information meant to be driven into your brain each day. Previously on Fridays, the class focused on your concerns, whatever they may be. This would be a recitation, and was more likely to happen depending on the quality of questions sent in. Q: How should we send in our recitation questions? A: At this point, recitations will not be continuing on the site, so please save your questions. Q: So it’s a webcomic and not a blog? A: Do you see any emoting and endless talk in chatspeak? As has become my mantra when asked this question, "It's a webcomic, not a blog, goddamnit." I tried to lay out all my reasoning and descriptions of photocomics in this lesson. Q: Why are you in the comic images? Are you a narcissistic douche? A: STW is meant to be set up like a class, and as much as I would prefer not to be in the comic images, they just don't work as a class unless there is a professor/teacher present. So I am in them to add to the setting, but I would prefer not to be. Q: Why are some of the comics blurry? A: I prefer to take all the pictures myself - there have been only a few so far where working on a timer wasn't sufficient, and I needed someone else to take the picture. The end result is that sometimes the pose is blurry - which was actually encouraged by a few readers earlier on. Because the camera sometimes autofocused before I step into the scene, the final image can be just a bit off, which I didn't realize until I was ready to post it several days later. 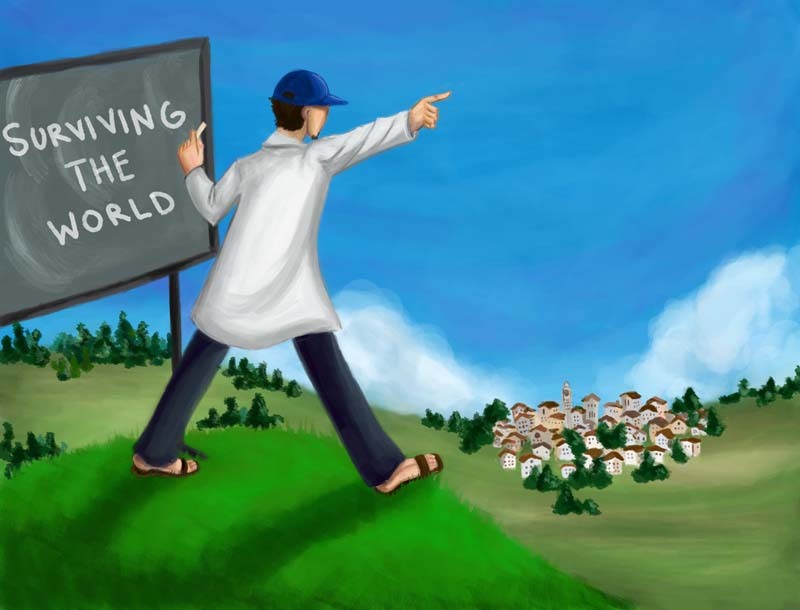 Q: How many people work on Surviving the World? There's a lot of 'we' slinging going around. A: At the beginning, I was fighting both a fear of failure and an uncomfortableness with potential success, so it became a lot easier to pretend that there was a creative team developing the comic together. Realistically, there's only me, although I do at times consult with others about the quality of different ideas. Q: What does “Surviving the World” really mean, anyway? A: The original name was going to be "101", but the site was first hosted at wordpress, and that name was already taken. "Surviving The World" was a real-world take on the same idea. Q: Will you link to my site? A: Um, maybe? The answer's probably no, though. Q: Do you accept guest-comics or guest-lectures? A: Keep an eye on the daily updates - if an 'oral presentation' version of the guest-lectures comes up, you'll be best notified there. Otherwise, please don't just send in random pictures, as I'm probably not going to use them. Q: Are you always high? You look like you're always high. A: I wear hard contact lenses for 14-18 hours a day, so my eyes are always red. It's a pretty common misconception. A: While monogamy may be passe, sorry, but I'm already happily married. Q: Can I plagiarize anything I find here on the site? A: All content on Surviving the World in any form is copyrighted as of 2008-2013, and all rights are reserved. So, no. But if you give the site proper credit and recognition, feel free to embed or post the lessons elsewhere on the internet with a link back to STW. Q: Would you like to thank anyone? A: Why, yes, thanks for setting me up. STW would like to thank theSwede, Cannonball, Torpedo, Westley, Sprite, Shiv, Bitey, Wakefield, and all other family and friends.